Discover the ultimate in luxurious aromatherapy and massage oils. 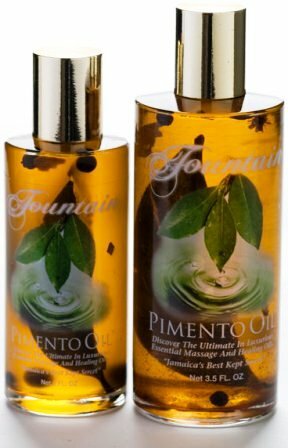 This remarkable blend of berries, leaves, and spices, create a pure, essential body oil that is unique to Bath Fountain,a natural mineral spa and popular a tourist attraction in rural Jamaica. Fermented over time without any additives or preservatives, this vital mix of ingredients, native to the Caribbean, is an excellent natural pain medication, relaxant, moisturizer and skin toner. This powerful liquid remedy is renowned in Jamaica for its soothing, healing and antioxidant properties and is truly a "miracle oil". Contains pimento oil (allspice), eucalyptus leaves, peppermint, cinnamon, lemon grass, nutmeg, and Jamaican Black Castor Oil.